Exuding distinct elegance and class, the Granada Hills-based Signature Banquet Hall has been specifically designed as a function venue, with the flexibility and space to hold up to 500 wedding guests. Whether you are planning a huge multicultural wedding celebration with family from both near and far, or a glamorous wedding banquet with a guest list you just can’t cut down, the Signature Banquet Hall has both the facilities and services to create an incredible day. They have a state-of-the-art lighting and sound system that will transform the space into anything your heart desires. Choose your preferred up lighting and ceiling spot lights to create a romantic ambiance and highlight specific events taking place throughout your special day. 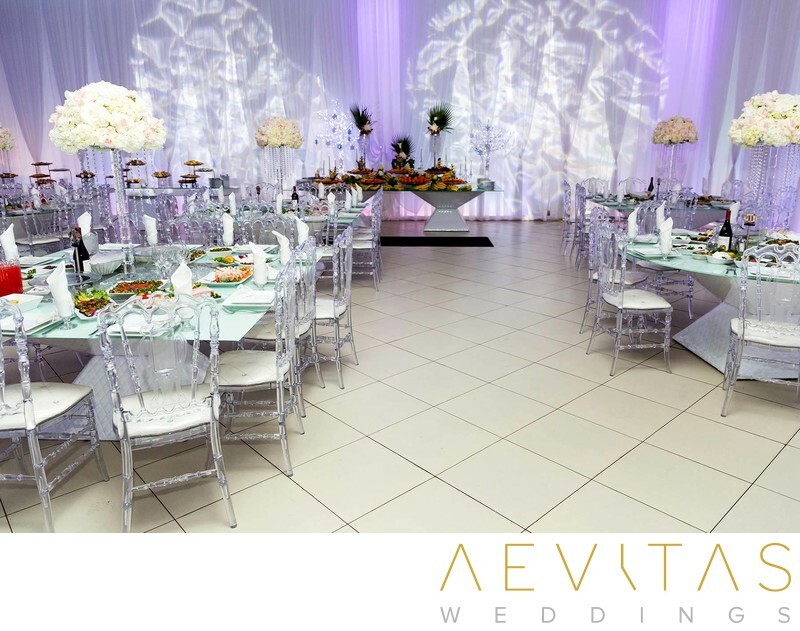 While the Signature Banquet Hall is ideally designed for lavish wedding receptions, it can also be used for your ceremony, creating an all-in-one wedding day location. Their team of event organizers are highly experienced in large scale wedding planning and will assist you in even the smallest details to ensure your day runs as smoothly as possible. The Signature Banquet Hall’s catering team can do everything from indulgent Indian feasts to fine-dining cuisine, so no matter the cultural influence or culinary style you desire, they will take care of everything. Treat your wedding guests to a sumptuous meal, with ornate table decorations and centerpieces, then dance into the late evening on the sprawling dance floor. Whether you hire a DJ or live band, or incorporate traditional dance performances into your reception plans, the Signature Banquet Hall’s “techsperts” will create an ambiance that is warm and celebratory, with this visual spectacle reflected in your wedding photos. The elevated sweetheart table at one end of the ballroom allows you and your loved one to be the absolute center of attention, with your wedding photographer able to capture intimate portraits and candid reactions throughout the reception. The elegant furnishings, mosaic tile work and cascading fountain at the Signature Banquet Hall also make for stunning wedding photo features, particularly during nighttime portrait shoots. For couples who want ease of planning, without compromising on the opulence and grandeur of their wedding day, the Signature Banquet Hall’s facilities and team of staff are equipped to make it all possible.